Hello dear friends: I have a card to share with you this very, very stormy morning made with on of the cutest sets of critters I own. It's from My Favorite Things and it's called The Whole Herd. I mean, can this cows be more adorable? 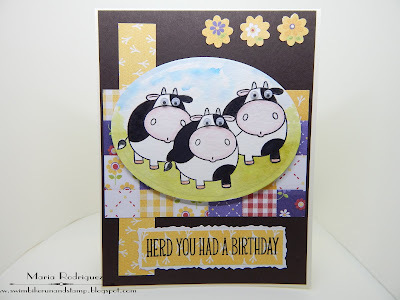 I stamped them onto a water color paper oval die cut with Stazon black ink and colored them with Prismacolor pencils and Distress Inks in Shabby Shutters for the grass, Broken China for the sky and a bit of Spun Sugar for their cute little snouts. The pattern papers are from a retired collection from Lili of the Valley, the sentiment from the set. 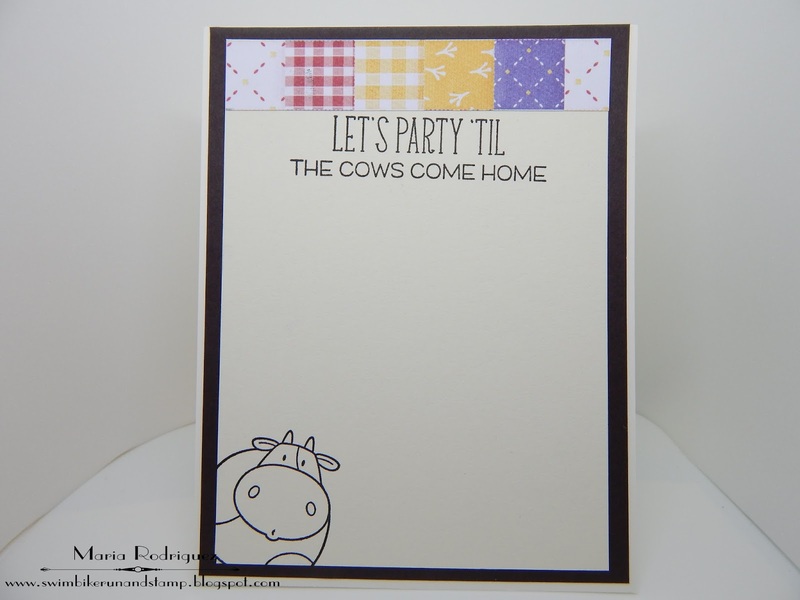 I just glued a scrap strip of the pattern paper and stamped the sentiment and the cow from the set. 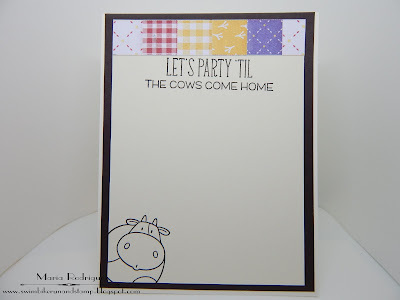 Pause,Dream,Enjoy Challenges #182 "Down on the Farm"
Happy Little Stampers July challenge "Animals"
The Crafty Addicts Challenge #38 Anything goes/Something Humorous. Crafty Animals Anything Goes/must have animals. Hello everyone: We at RETRO RUBBER, have a new challenge for you to have some fun with, this time we want to see RAINBOWS!! 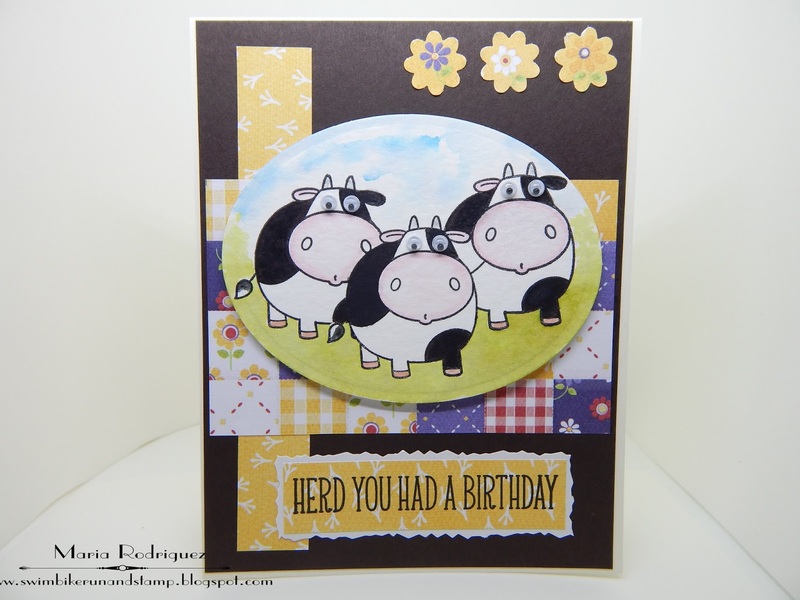 Here is this card I made to inspire you to join my teammates and I in our gallery. This sweet little Hedgehogs are from a Penny Black stamp set called "WONDERFUL" I bought it back in March of 2014. 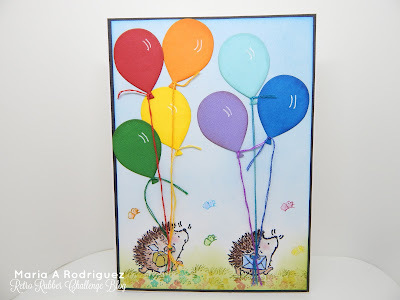 I stamped this two cuties onto a panel of water color paper with Stazon black ink, sponged the sky and grass with Distress Inks in Shabby Shutters and Tumbled Glass, die cut the balloons and added some embroidery strings using a glue dot to attach them to the hands of the little Hedgehogs. 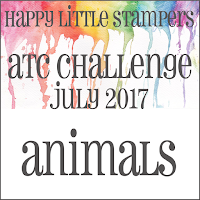 The sprigs of grass and flowers are stamped with a couple of Art Impressions stamps. Now, I'm going to show you another card I made with Rainbow colors. I saw THIS VIDEO by Nicole Picadura that encouraged me to give this technique a try. 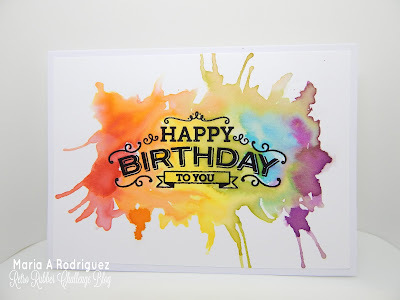 I always love seeing cards with gorgeous water color washes but, every time I attempt to make one, I end up with a muddy mess. This is not all the pretty I would have wanted but at least the colors are not completely messed up. I kind of like the colors on the left, with the reds and orange tones but, it starts getting bad after the yellow and blue, the purple at the end was saved because I soaked the puddle of water that was mixing the green and blue and overtaking the purple. I need A LOT more practice, this is kind of ok for my first try. Here is a picture of the finished inside of my first card. The sentiment is from Hero Arts and I inked it up using my SU markers in Real Red, Daffodil Delight, Old Olive, Tempting Turquoise and Elegant Eggplant. So stop by the RETRO RUBBER to see the awesome cards my teammates have there for your inspiration and please join us in the gallery. please mention the age of your stamps or how long you've had them. Only new work, no back linking please. You can enter up to 10 challenges including ours. Hello everyone: This week over at SHOPPING OUR STASH, we have a new challenge for you to have some fun with. 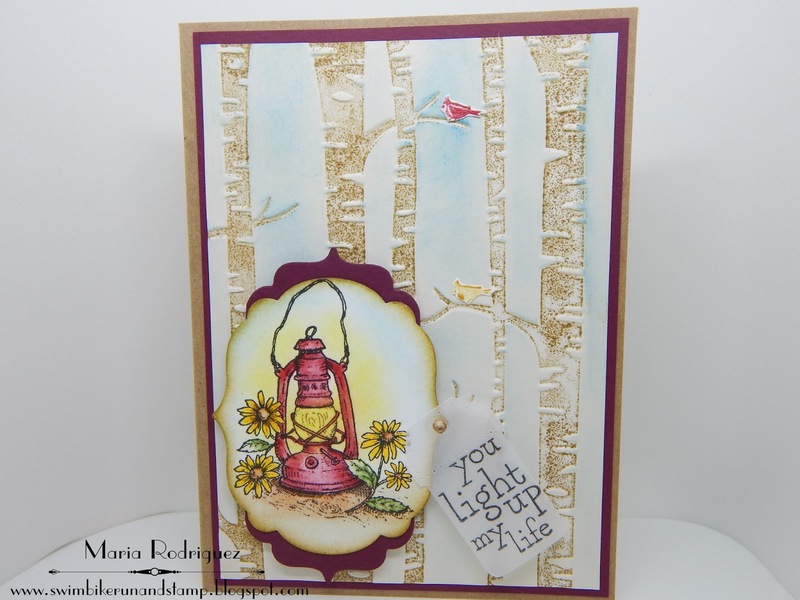 The theme is "You Light Up My Life" which means we want you to use any kind of light source image on your cards. 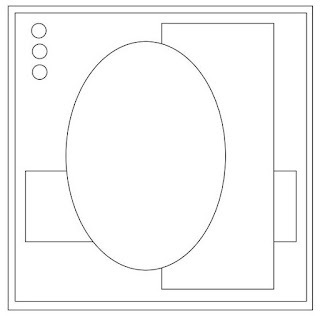 It could be a lamp, flash light, lantern, etc. you get the picture. Here is the card I made to hopefully inspire you to join my teammates and I in the gallery. This pretty image is from my old stash of Flourishes sets and it's called "S'more Fun". 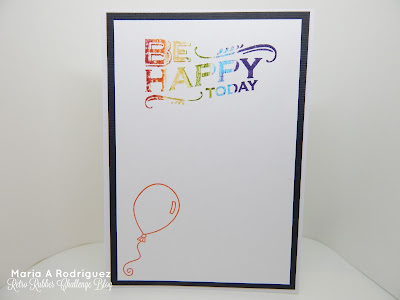 I stamped it with Stazon black ink onto a die cut piece of water color paper and colored it with my Prismacolor pencils. I applied a bit of Hello Honey with a sponge dauber for the glow. The background is done with the retired SU embossing folder called "Woodland", I applied a thin coat of Baked Brown Sugar to the side that is not raised and ran the card stock through the Big Shot. I sponged a bit of Broken China between the trees for a sky and I stamped and die cut the little Cardinal Birds with a teeny tiny cardinal die from a collection from Paper Tray Ink called "All Through the House". 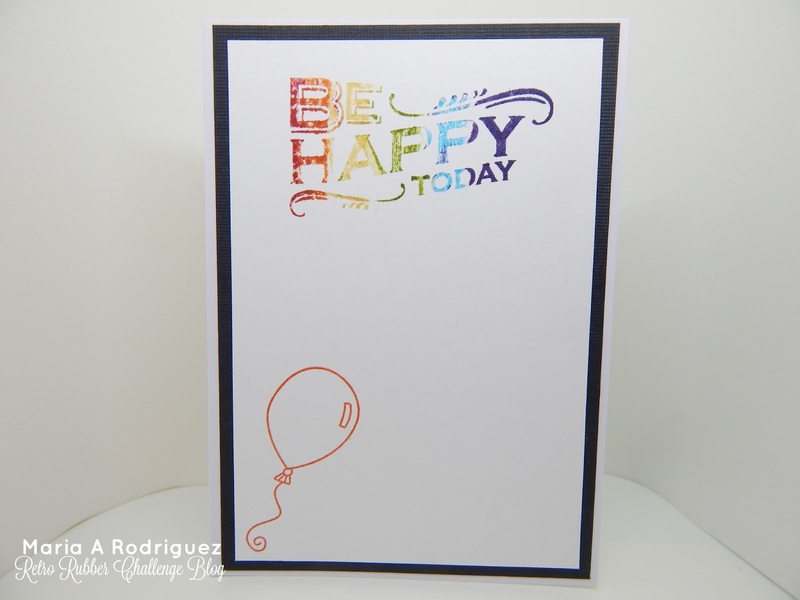 The sentiment is from the Flourishes set, stamped onto Vellum. 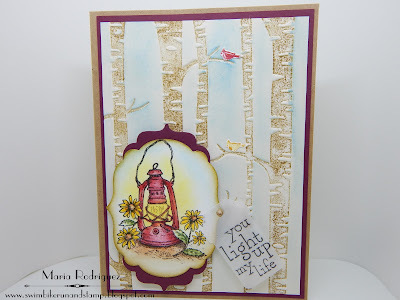 The sentiment and corner flowers are from a Power Poppy set called Sunny Harvest, stamped with Hello Honey ink. I hope you come and play along with us over at SHOPPING OUR STASH, don't forget to visit the blogs of my teammates for even more inspiration.